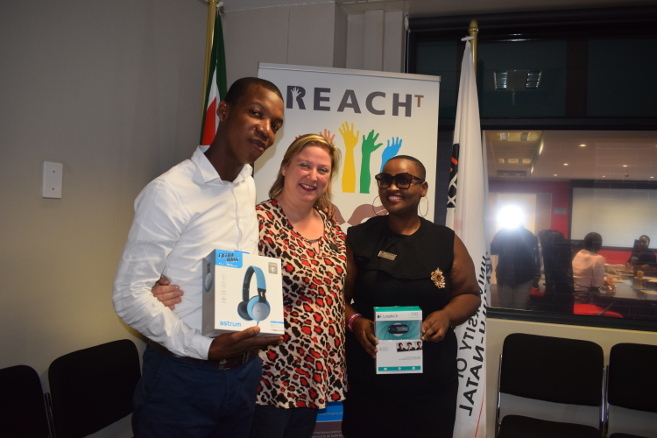 Operations Manager at the School of Clinical Medicine Ms Antoinette Botha congratulates techo-support competition winner Ms Nomvano Fiko and runner-up Mr Smanga Khuzwayo. The School of Clinical Medicine (SCM) recently rewarded winners of the SCM Microsoft Lync Competition which targeted professional services staff at the School, encouraging them to make more use of video calls for office communication. ‘From 2014, there has been a steady decline in our communication expenditure as a result of doing away with a number of telephone lines that were not in use,’ said competition initiator and School Operations Manager, Ms Antoinette Botha. ‘Microsoft Lync provides instant messaging (IM), audio and video calls, Lync meetings which provide swifter and more efficient messaging, and most importantly add a face-to-face communication. ‘Unlike sending emails where there can be misinterpreted messages going back and forth, Sync video calls are short, clear, cost effective and add a face-to-face human element,’ she said. The School hopes that with the majority of staff having used the programme and discovered how easy it is to communicate with it, they will make more use of it thus helping the School reduce its telephone bill.